Think summer footwear and chances are brightly coloured flip flops and sandals are springing to mind. But let’s face it—they’re not exactly stylish or work-appropriate, are they? Well, this season there’s an alternative. The humble espadrille may not scream fashion-forward but it’s set to be the surprise hit of the summer, and it’s time you got in on the canvas action. 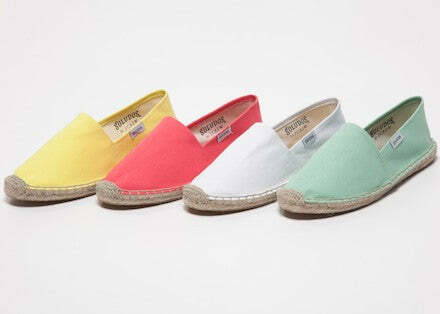 Since the warmer weather started making an appearance a mere few days ago, sales of espadrilles have soared. One online boutique has even reported a whopping 88% growth over the last week alone, and although they may not be the traditional choice when it comes to fashion they’re a slow-burning hit. They haven’t enjoyed this much coverage since Miami Vice made them famous in the 80s, but since they made an impromptu appearance on the catwalks last year they’ve filtered down into the high street and now everyone’s clamouring to get their hands on a pair of these rope-soled beauties. A bit of celebrity endorsement always helps matters, and with the likes of Beyoncé and Cameron Diaz both being snapped in designer pairs over the last week you’ll be in good company. Fashion directors, editors and industry insiders are huge fans as well, adding extra credibility into the mix, and with plenty of different styles to choose from you won’t be short of options. They’ve been given a definite upgrade too with new textures, colour palettes and even leather versions being available, giving them a fashionable edge whilst ensuring they retain the qualities of comfort and practicality that made them so popular in the first place. Better yet, they’re ideal for any occasion necessary. Get the right pair and you’ll have shoes that will be just as suitable for the office as they will be for after work drinks, and of course, they’re a must-have at the beach. Team them with a simple summer jacket and you’ll be good to go (full-on white suit a ‘la Don Johnson entirely optional), so what are you waiting for? The underdog of the shoe world is most definitely back on the map, so see what you can uncover and you’ll be putting your best foot forward in style.